I’ve used this method for cooking ribeye roast (aka boneless Prime Rib) before, but as part of a bigger recipe. I figured I’d include it all by itself for easier reference. It can be served by itself or with a sauce. These instructions are for a 6lb roast. If yours is larger, add some additional cooking time. This recipe takes a total of about 6 hours, but only about 5 minutes of actual active time. About six hours before your serving time, remove the roast from the fridge, uncover, dry surfaces with a smooth towel, and allow to sit uncovered at room temperature for about 3 hours. This will dry the surface, giving it a good crust. Rub the roast with the pressed garlic. Rub with kosher salt all over the surfaces. Sprinkle with black pepper and dried thyme. Put on a roasting pan and place in the oven. Cook for 20 minutes. Turn down the temperature to 300F and cook until it reaches an internal temperature of about 130 F for a bright red medium-rare roast, about 90 minutes. Alternatively, once it reaches 125F, turn oven to 425F and cook for a few more minutes until it gets to 130F. Remove from the oven. Tent with aluminum foil and let rest for 20 to 30 minutes before serving. Carve and serve. It doesn’t look very appetizing now, does it? And its name, “old clothing” in Spanish, doesn’t make it sound like something you want to rush to eat. And yet, this simple Cuban dish is as delicious as anything you’ll ever eat. It takes some time to make, but it’s well worth it. I first discovered Ropa Vieja in a copy of The Frugal Gourmet on Our Immigrant Ancestors: Recipes You Should Have Gotten from Your Grandmother I borrowed from the Berkeley public library. It was 1993, I was newly married and determined to cook for my husband. 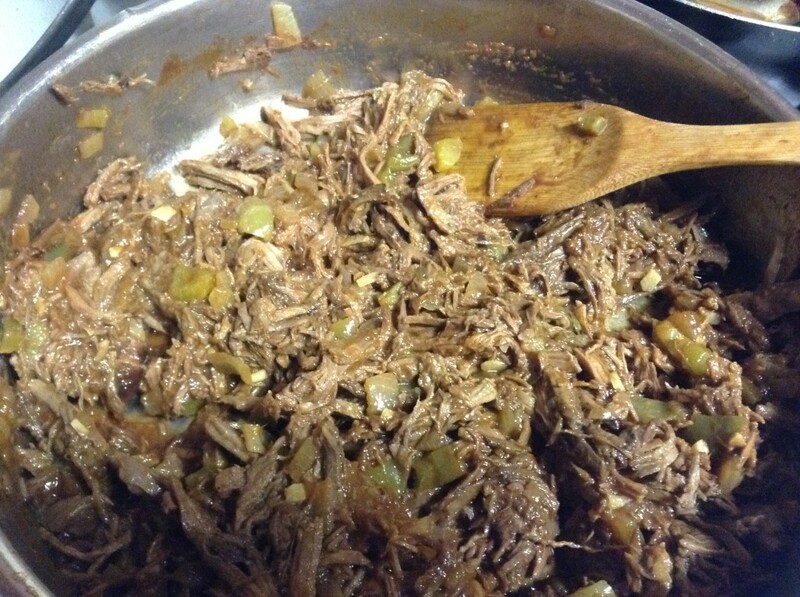 That year I became a cook, a good cook if I may say so myself, and Ropa Vieja has been a favorite I’ve gone back to time after time. I haven’t modified the original recipe much, but I have found that this dish is best served with sourdough bread. Lots of it. Pat dry the roast. Season with salt and pepper on all sides. Heat vegetable oil over high heat in a large cooking pot. Add the beef and brown on all sides. Remove roast. Pour out and discard fat. Return pot and beef to the stove. Add 1/2 cup of water and bring to a boil. Cover, lower heat to low and cook for 2 hours. Turn off heat and let cool for at least an hour. When the meat is cool, shred it into strips using your hands. Place in a bowl and pour the broth remaining in the pot over it. Heat olive oil over medium heat in a large, clean lidded pan. Add the onion and garlic and cook until they start to caramelize. Add the bell pepper and cook until soft. Add the meat, tomato sauce, wine and bay leaves. Season with salt and pepper to taste and bring to a boil. Cover, reduce the heat to low and cook for 15 minutes. Uncover and cook for another 15 minutes. Taste for seasoning and serve. This year – 2012 – short ribs were eatured as the main dish on my Christmas Eve dinner table. I love short ribs and I couldn’t think of anything else to make for this dinner. Of course, I had to try a new recipe because I wasn’t in love with any of the ones I made before, plus I always like trying new things. I think this recipe was quite successful. I’m not ready to say it was the best short rib recipe I’ve ever made, but it definitely was tasty and the sauce was delicious – both with the short ribs and the garlic mashed potatoes I served it with. The sauce was definitely rich and well balanced. The ribs, btw, were succulent and fall-off-the-bone tender. Regardless of what recipe I use in the future, I will cook them in this manner. I made the short ribs the day before, not only because I don’t want to be crazy cooking on Christmas Eve, but because braised short-ribs are always better the next day. I got this recipe from Chuck Hughes of the Cooking Channel (I had never heard of either, I found it through Google) and I modified it slightly. I used a roasting pan for this dish, as I had nothing else that was large enough for the ribs and veggies. I placed it on the stove over two burners. It will serve 6 people. Trim excess fat from the ribs. Season well with coarse salt. Dredge in flour. Coat the bottom of a roasting pan with Canola oil and place on the stove over medium-high heat. When hot, add the short ribs and brown on all sides. Remove and set aside. Add the onions, celery, carrots, garlic, rosemary, thyme, star anise and cinnamon sticks to the pan. Cook until they caramelize, stirring frequently. Return meat to the pan and pour wine over the ribs. If they are not completely covered, top with water. Mix in cocoa power, brown sugar and peppercorns and bring to a boil. Cover tightly with aluminum foil, put in the oven, and cook for 3 hours. Carefully remove ribs, and set aside. Strain out the braising liquid into a large cooking pot. Discard the veggies. Place the pot on the stove and boil over medium-high heat until the liquid is reduced by about 1/3rd. Return the short ribs to the pot. Cool and then refrigerate until the next day. When ready to reheat (30 to 60 minutes before serving), place the pot on the stove over medium heat and cook uncover until the liquid starts boiling. Stir to make sure the short ribs are moist all over. Cover and turn the heat down to a simmer. Five minutes before serving, remove the ribs and place on the serving platter. Cover with a kitchen towel to keep warm. Taste the liquid, adjust seasoning and reduce further if needed to make it more intense. Add butter and serve with the ribs or on the side. Ropa Vieja, a very simple dish of beef in a tomato wine sauce, is one of my all time favorite dishes. Indeed, it’s a favorite of several members of my family, my sister asks me to make it every time she visits. I don’t quite understand how so few ingredients – the only seasoning on this dish is salt and bay leaves – can have such an amazing result, but it does. Fortunately for me, ropa vieja was one of the first dishes I discovered when I first started cooking, so I’ve been able to enjoy it for almost two decades. I used to serve it over white rice, but I actually prefer it with sourdough bread, though French bread is good too. The one problem this dish has is that it’s really hard to avoid eating the meat as you shred it. Sprinkle salt on all sides of the roast. Heat a very thin layer of oil in a large pot over medium-high heat. Add the roast and brown on all sides. Add one cup of water, turn down the heat to low and simmer, covered, for 2 to 3 hours or until cooked through. Turn off the heat and let cool down in the broth, covered. Once the beef is cool enough to handle, shred the whole roast by hand, discarding hard pieces of fat. Mix the broth from the pot with the beef and set aside. Wipe clean the pot you used and add another thin layer of oil. Heat over medium heat and then add the onions. Cook until soft, add the garlic and cook for a couple of minutes. Add the bell pepper and cook for five more minutes. Mix in the beef, tomato sauce, red wine and bay leaves. Season with salt to taste. Bring to a boil, then turn down heat and simmer, covered, for 30 minutes. Flat iron steak is a newish cut in America that has become popular at posh restaurants. There are only 4 flat iron steaks per cow, so it’s not a cut that you can often find at supermarkets (though Safeway sell them pre-packaged). They were on sale for $4 lb at Lucky’s this week so I bought some for dinner. Mika loved them. 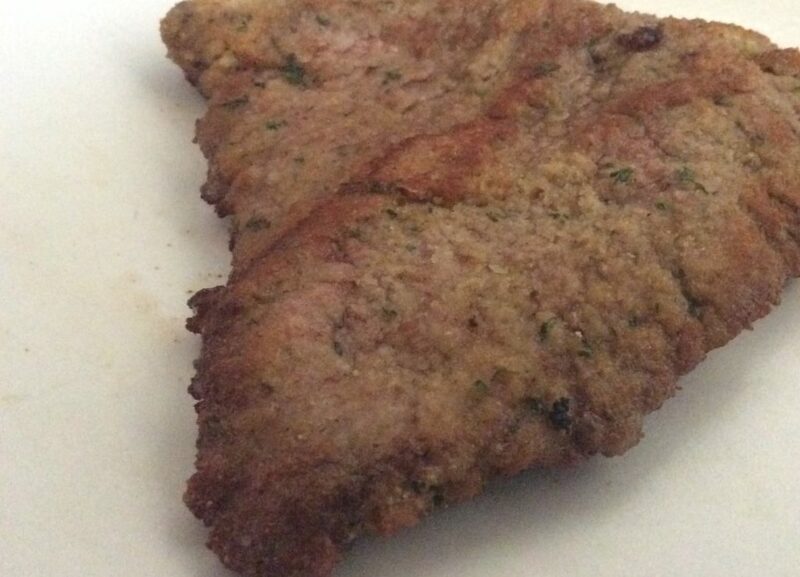 Though they had a thick piece of connecting tissue in the middle, the steaks themselves are very tender. They are not terribly flavorful, however, though a good sauce can take care of that. At $4 lb, they are a great alternative to filet mignon. I grilled them on the BBQ grill outside and they are quick and easy to prepare: pre-heat the grill on medium-high, salt & pepper the steaks, brush with olive oil, grill on each side for 4 minutes for medium rare, let rest for at least 5 minutes before serving. I’ll definitely buy this cut again when it’s available at this price.